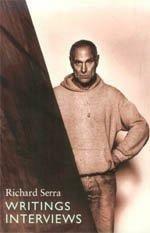  This collection of essays and interviews spans two decades of the sculptor's work and life. Serra is known for his site-specific works and perhaps best known for Tilted Arc, which was commissioned by a federal agency (the General Services Administration) in 1979 to stand at the Federal Plaza in Manhattan; it was then torn down by the agency in 1989, raising all sorts of problematic issues about censorship, government support for the arts, and the conflict between legal property rights and legal rights of expression. Serra here takes himself seriously--some might say too seriously. He also comes off as a man who, understandably, has little patience with troglodyte philistinism such as that exhibited by a judge who suspected that Tilted Arc had caused a ``downtown rat problem'' in its environs.